For the Sunday night broadcast of old radio programs on WAMU, see Ed Walker (radio personality). For the radio show on WFUV, see Rich Conaty. 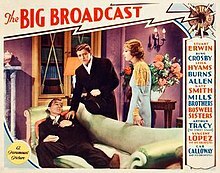 The Big Broadcast is a 1932 American Pre-Code musical comedy film directed by Frank Tuttle and starring Bing Crosby, Stuart Erwin, and Leila Hyams. Based on the play Wild Waves by William Ford Manley, the film is about a radio-singer who becomes a popular hit with audiences, but takes a casual approach to his career. A casual affair leads to his dismissal, but his career is saved by the station manager who buys the station and gives him his job back. The film co-stars George Burns and Gracie Allen in supporting roles. The Big Broadcast was produced by Paramount Pictures and was the first in a series of four Big Broadcast movies. Radio-singer Bing Crosby is not very serious about his career. His chronic tardiness and his affair with the notorious Mona Lowe (Sharon Lynn) has become an issue at station WADX. After Mona cheats on him, the despondent singer meets Texas oil man Leslie McWhinney (Stuart Erwin), who has also been wronged by a woman. Soon after, Anita Rogers (Leila Hyams), the former fiancée of McWhinney, falls in love with Crosby. Meanwhile, station manager George Burns is plagued by the addled conversation of his stenographer, Gracie Allen and eventually loses the radio station. McWhinney buys the station in order to help out Crosby and Anita, whom he still loves. McWhinney comes up with the idea of putting on a "big broadcast" of stars to pull the station out of debt. Mona returns on the scene and threatens the budding romance between Crosby and Anita, as well as the station's upcoming big broadcast. McWhinney tries to find a phonograph record to replace the absent Crosby, and ends up impersonating Crosby on the air. The singer returns and takes the microphone in mid-song. Crosby, who actually has been feigning irresponsibility to bring McWhinney and Anita together, succeeds both in reuniting the former lovers and in taming Mona. It was Bing Crosby's first starring role in a full-length film and generally he got good reviews. "The film is a credit to Crosby as a screen juve possibility, although he has a decidedly dizzy and uncertain role which makes him behave as no human being does." The New York American commented: "Bing Crosby is the star, make no mistake about it. The “Blue of the Night” boy is a picture personality, as he demonstrated in his two-reelers. He has a camera face and a camera presence. Always at ease, he troupes like a veteran." The Hollywood Citizen News had more to say: ".... Bing Crosby croons several attractive songs which seem destined to enjoy wide popularity. For that matter, he needn’t be ashamed of his acting either. Burns and Allen have several good comedy sequences, and Cab Calloway and his orchestra are excellent in one sequence. All the radio stars are heard much as you hear them on the air. The novelty of seeing them may be an attraction. But Tuttle has not relied upon the drawing power of that novelty. He has injected little touches of fantasy, hints of satire, moments of slapstick comedy and a general impression of jolly good humor. He tells you frankly that this picture is not to be taken seriously and I think that most audiences will believe him and thereby enjoy it." Introductory sequence (signature tunes): "Where the Blue of the Night" (sung by Bing Crosby]; "When the Moon Comes over the Mountain" (sung by Kate Smith); "Shout, Sister, Shout" (sung by The Boswell Sisters); "Minnie the Moocher" (sung by Cab Calloway); "Goodbye Blues" (sung by The Mills Brothers). Crosby recorded the songs for Brunswick Records and "Dinah" and "Please" both topped the charts of the day. ^ "The Big Broadcast". Internet Movie Database. Retrieved August 4, 2012. ^ "Variety". Variety. October 19, 1932. ^ "New York American". New York American. ^ "Hollywood Citizen News". Hollywood Citizen News. October 14, 1932. ^ "Full cast and crew for The Big Broadcast". Internet Movie Database. Retrieved August 4, 2012. ^ "Locations for The Big Broadcast". Internet Movie Database. Retrieved August 4, 2012. ^ Reynolds, Fred. Road to Hollywood. John Joyce. pp. 46–47. ^ "A Bing Crosby Discography". A Bing Crosby Discography. Retrieved January 26, 2016. ^ Whitburn, Joel (1986). Pop Memories 1890-1954. Wisconsin, USA: Record Research Inc. p. 104. ISBN 0-89820-083-0. This page was last edited on 2 March 2019, at 17:02 (UTC).